GNS Hosted Office is a Private-Cloud-Enabled-Office IT solution for hedge funds and asset managers. All critical office infrastructure is hosted in our secure colocation facilities. We have tailored our office support model to provide extremely high reliability and value. We do this by incorporating the latest technology with our award winning private cloud. We have designed this solution with mobility, speed and resiliency in mind. Users can login from any device, anywhere, anytime, and get full access to files and applications as if they were at their desk. You'll receive super-fast connection times at the office while also having the option of accessing your documents and applications at home or on the move. If your office ever goes 'off line', GNS has you covered. You'll be able to work from anywhere that has an internet connection, even from your mobile device. Our hybrid configuration based on local workstations provides superior screen performance to that of a full VDI solution. It also supports multiple monitors and the high quality graphic configurations that financial professionals require. In today's cloud enabled world, the best business solutions for commodity services, like email, telephone, compliance, and archival backup, are generally provided by specialty providers. They provide improved pricing and flexibility for our clients. 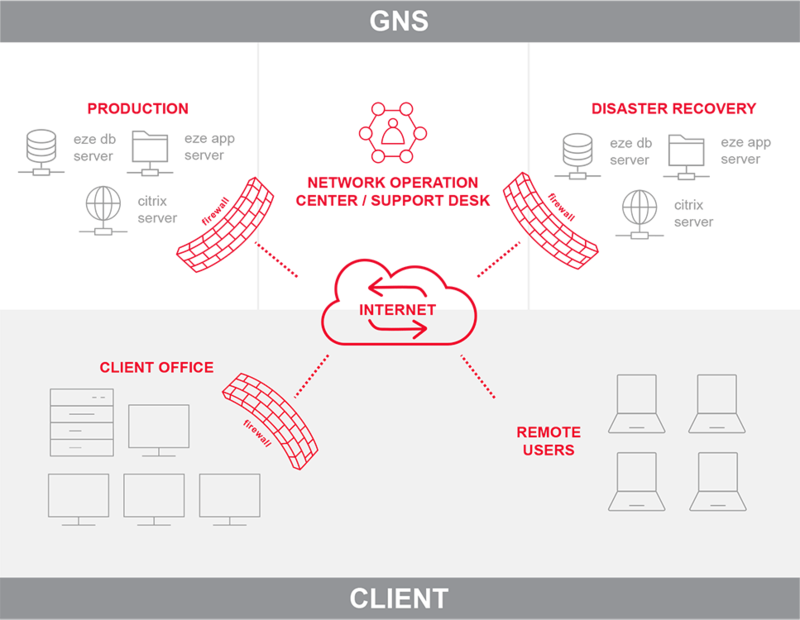 GNS manages the support and provisioning of these business critical services for you. Users can login, review, and take action on a wide variety of information within their environment. Extensive monitoring is built into all systems to catch potential issues before they ever impact a client. Application issues, resource limits, connectivity problems, and hardware failures are all detected and corrected automatically. Capacity information for all servers and key network equipment is fed into a real time database that supports a comprehensive reporting system. Support requests submitted by clients are reviewed by a machine learning system. Many client email requests are handled within seconds by these automated systems. When your website contains business critical information, or you need to provide a sophisticated secure portal for your clients, standard consumer grade web hosting is insufficient. GNS can provide a managed, PCI-compliant site that is proactively monitored with extensive IDS and IPS systems. Our team has built a great number of internal and external sites, and we are well-versed in all of today's web-technologies. We can also help you find a designer for your site, or help your current designer get things up and running in the shortest time possible, no matter what technology they are using. Contact our team for more details.